Ripaille, located between Thonon and Evian on the banks of Lake Geneva (Lac Leman), is one of the most notable places of history, nature and beauty in the Haute-Savoie. 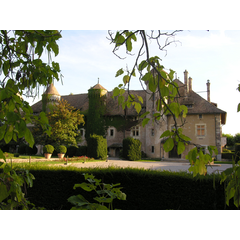 This former residence of the Dukes of Savoie, also a Charterhouse in the Middle-Ages, was in ruins when, in 1892, it was bought by an industrialist and art lover, Frédéric Engel-Gros. He restored the domain, including the historic buildings, the gardens and the large park. Today, Ripaille is mainly a private domain producing a famous AOC wine. The most interesting parts of the domain are open to visitors and lots of events are organized during the year.